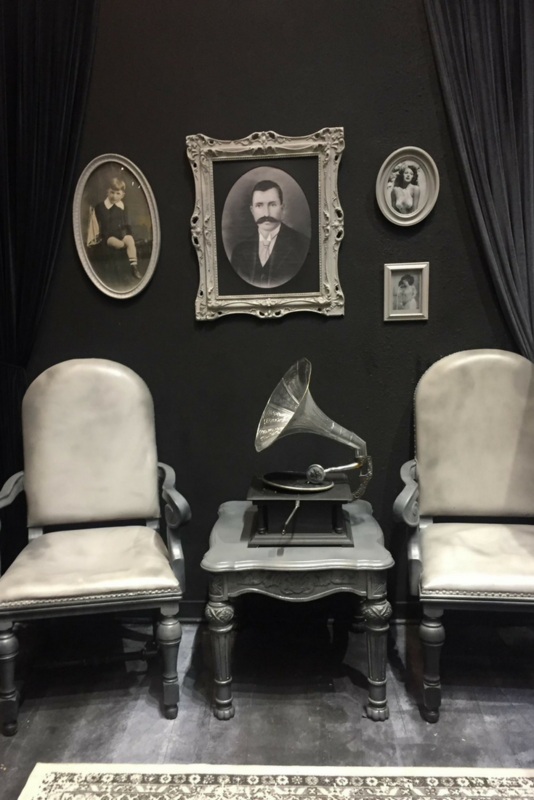 The biggest trend in Los Angeles these days seems to be pop up museums. 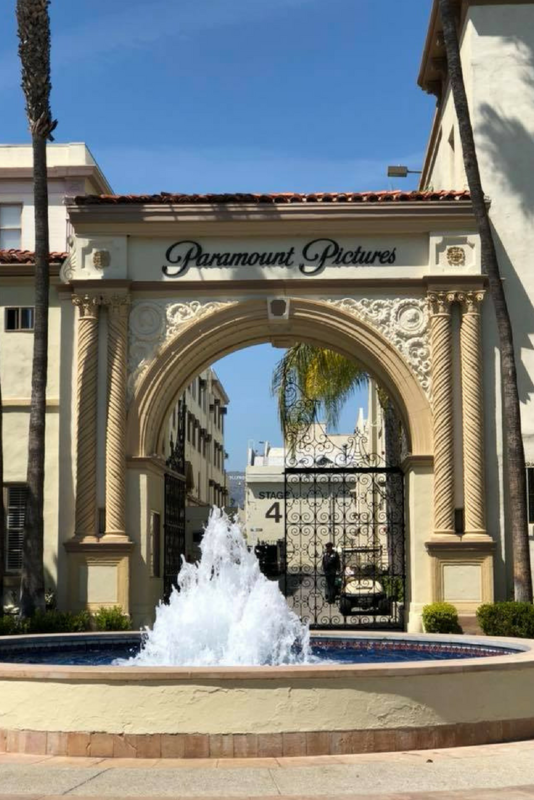 Just last week Hollywood hosted the pop up Mermaid Museum and now the Museum of Selfies has opened up in Glendale. 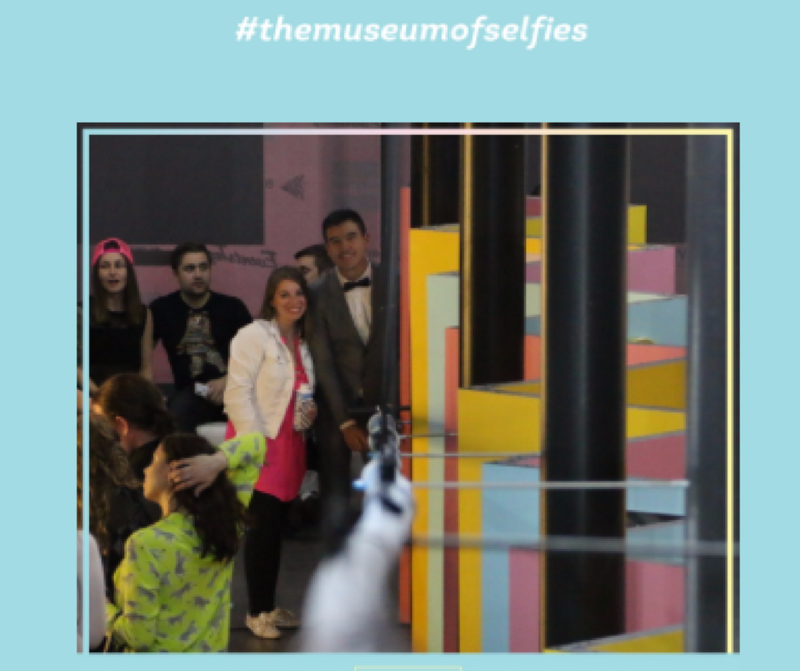 The Museum of Selfies is a pop up museum that will be open for at least three months. If it proves to be popular like the Museum of Ice Cream I imagine that they will extend their stay. The museum opens to the public on April 1st. Last night I was invited to the grand opening party so that I would be able to share about this awesome place with all of you! The museum is located at 211 North Brand Blvd in Glendale. You can get tickets via Goldstar by clicking here. Free parking is available behind the museum in the structure on Orange. You can only stay for 90 minutes max though if you want it to be completely free parking. Another alternative is to park at the Glendale Galleria and do a bit of walking. If you want to try and park closer be sure to have a good amount of quarters for the meters. When I stepped inside the museum there was a little red carpet set up. We were asked if we wanted our picture to be put on a cookie. Of course we said yes! It took ten minutes for the cookies to be printed so we came back for them later. 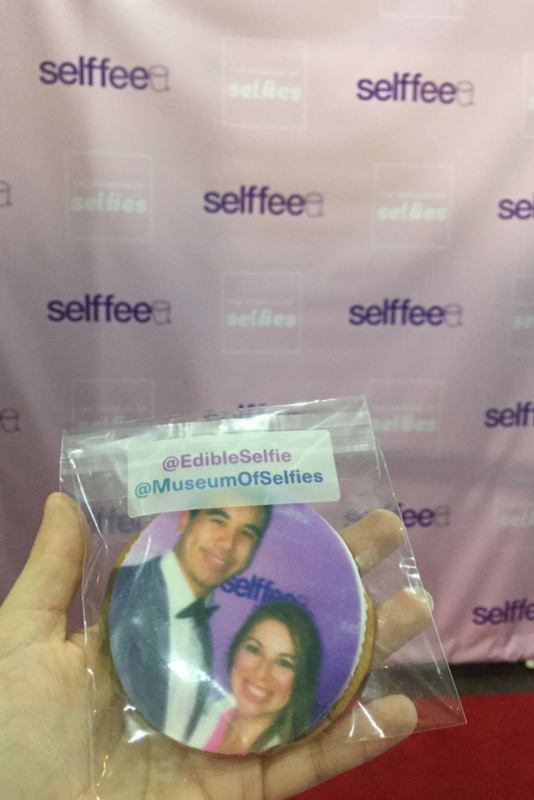 I’m not sure if the selfie cookies will be a permeant feature at the pop up but they were really cute. The first thing that you will see upon entering are paintings that have cellphones added to them. 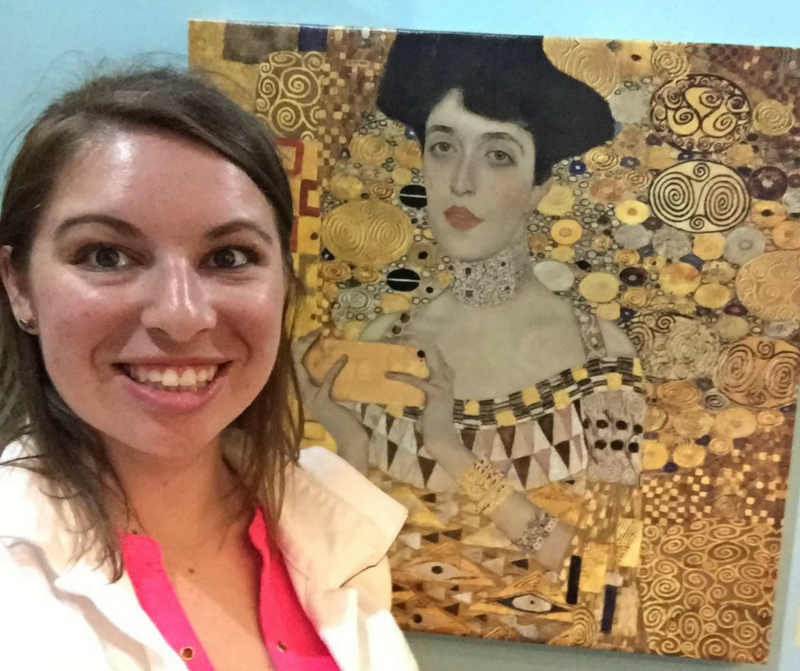 Some of the paintings are very recognizable like the woman in gold. They have all been given a fun millennial twist. 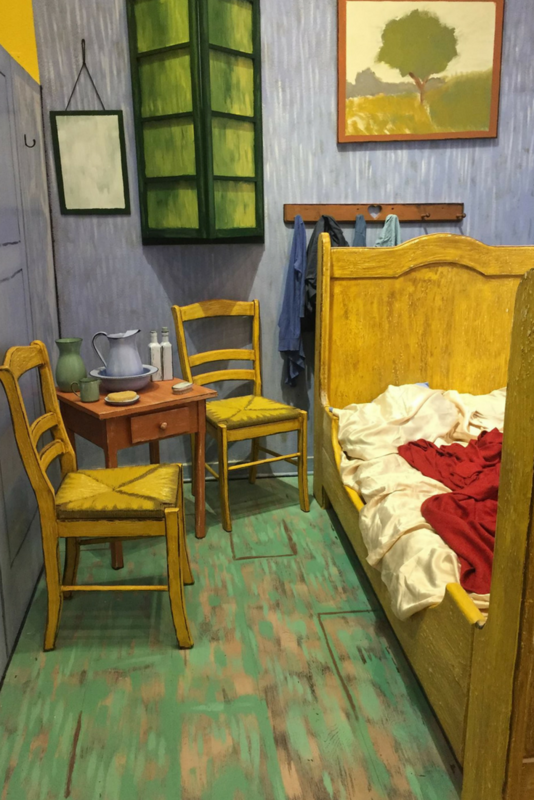 The first interactive display that we found is a spot that looks like Vincent Van Gough’s room. Next is a fun black and white space with several great photo ops. There are three statues that all look the same but each is a little different. The first statue is standing upright while the second statue looks like its starting to fall over. The third statue is in pieces on the ground. It’s fun to be creative with your photos here and make it look like you’ve knocked the statue over. 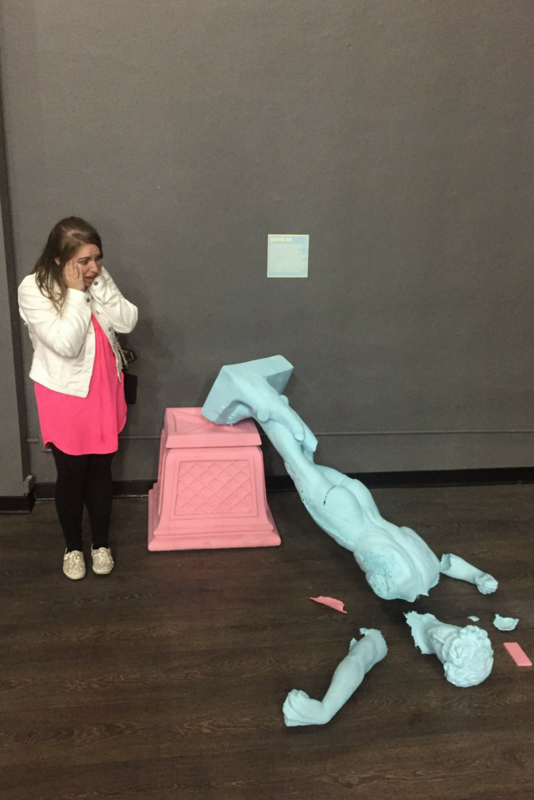 Did you know that people have actually broken museum pieces trying to take selfies? Bathroom mirror selfies are very popular. Well, here your bathroom mirror picture game is taken up a notch. 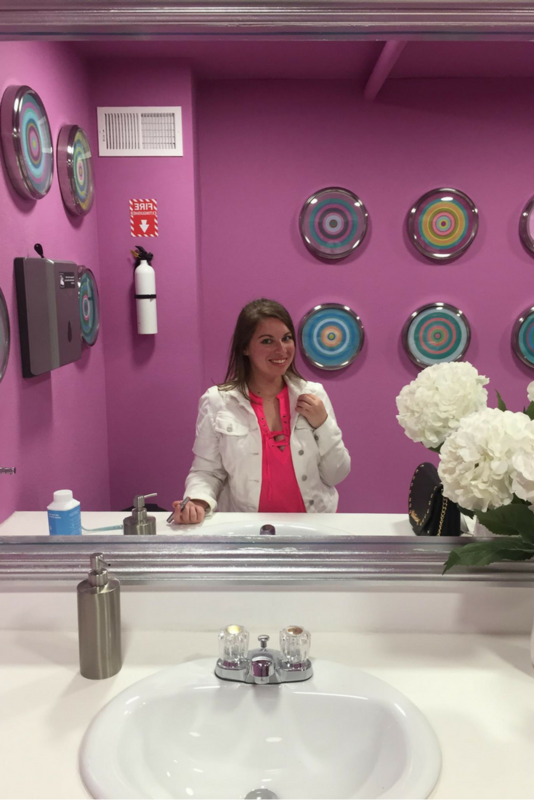 They created a two-sided bathroom so that you can take fun photos without your phone showing up in the mirror. This was my favorite spot in the entire museum. Have you really worked out if you didn’t take a gym selfie? I took a fun boomerang punching the bag with the boxing gloves. 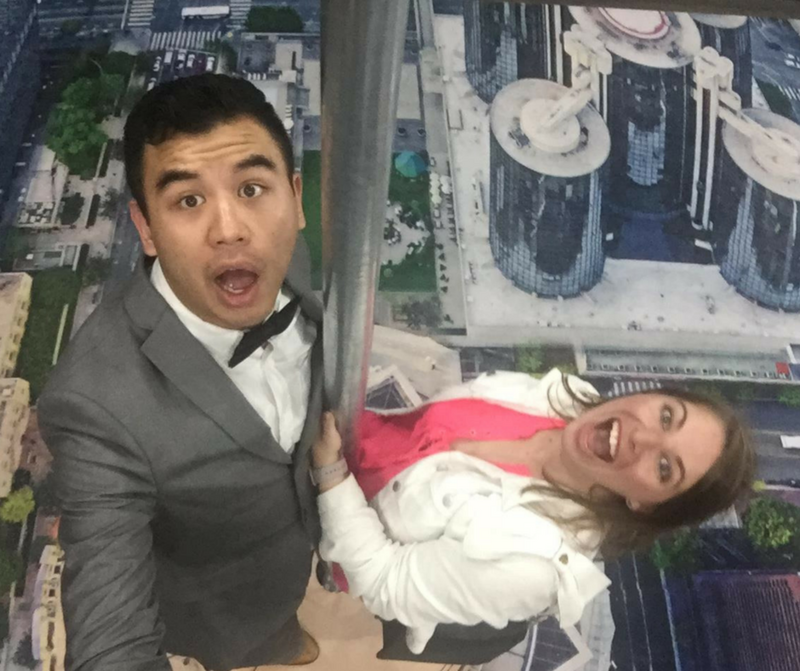 They have selfie sticks on hand for you to use to get a picture with the cityscape on the floor below you. Make sure to read the signs. I missed the one saying no shoes allowed in the striped room. At least I got a cute photo out of it. 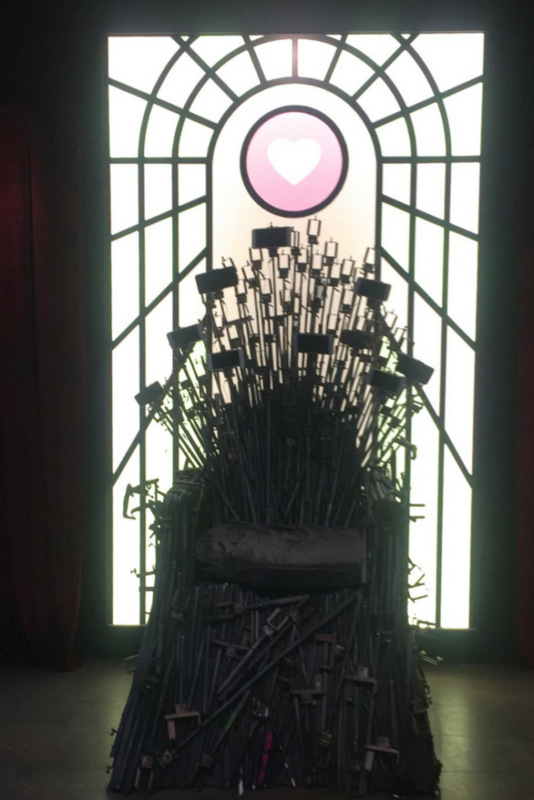 This is a throne that has been made using selfie sticks. Luckily, there is a cushion where you sit but be careful when you place your arms on the chair because pieces of the sticks are sharp. The only downside to this part is that the lighting is very tricky. If you tap on the screen so that you show up better in your picture it will wash out the Instagram heart located above. I love getting pictures with all of the angel wings in the Los Angeles area. 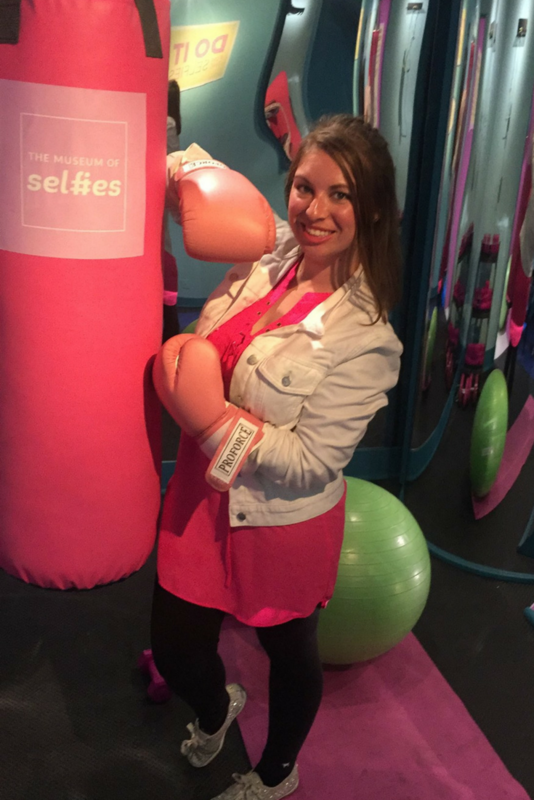 I was thrilled to see a set of wings at the selfie museum. 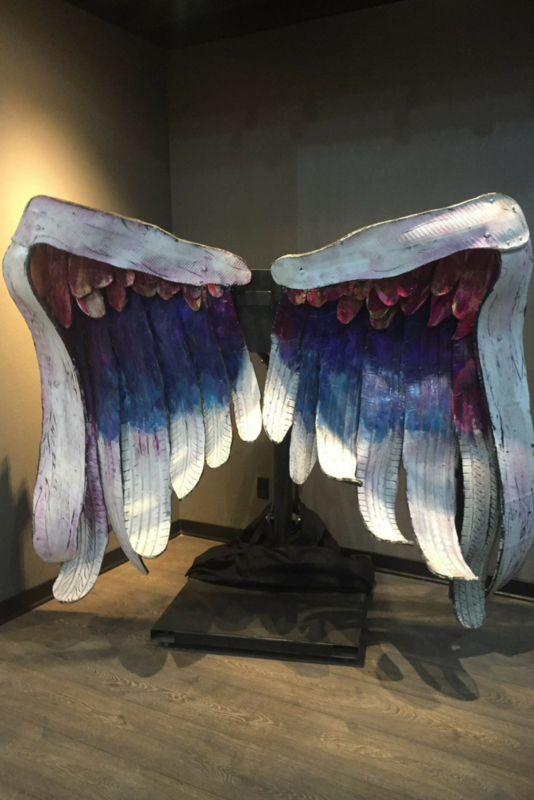 This particular pair of wings has been made with tires. 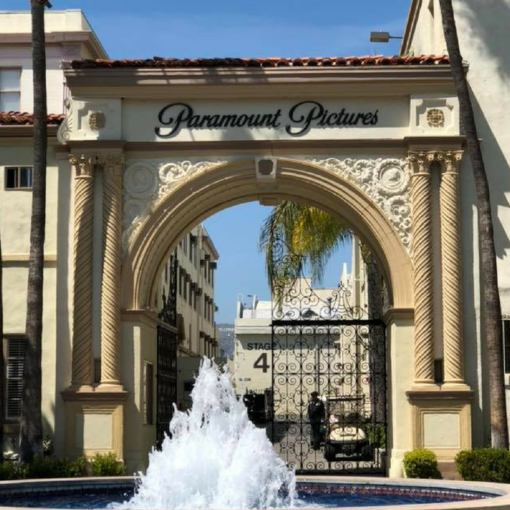 You can find my full list of where to find Angel Wings in LA here. There are two chances at the museum to send pictures to yourself. You can get a gif made for your Instagram at their little booth. My gif is of me taking selfies. You will also get a chance to get a picture with the worlds longest selfie stick. My picture is just above. It didn’t save properly in the email so it turned out a bit blurry. 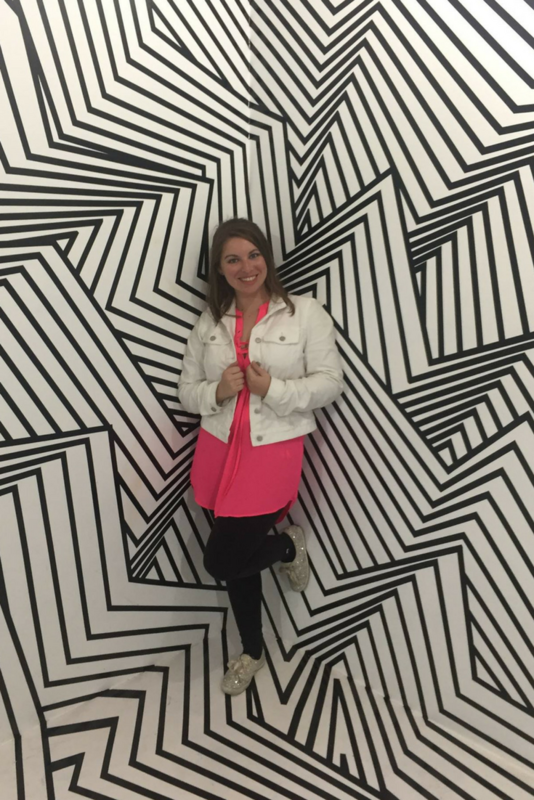 Is the museum worth checking out? Yes, as long as you love taking pictures or having your pictures taken. This is a fun place to go for an outing with your friends. If you want you & your friends to be in the majority of your pictures you might want to bring a selfie stick. Don’t forget that you can grab your tickets via Goldstar here.